This page has printable worksheets to use with the Kate DiCamillo's novel, Because of Winn-Dixie. Activities include reading comprehension questions, a word search puzzle, literature circle sheets, and vocabulary printables. This worksheet has eight reading comprehension questions that students can answer after reading the first five chapters of the book. This matching worksheet has vocabulary words for chapters 1 through 5. Words include skidded, constellation, missionary, fortunate, muttering,insulted, congregation, and potluck. 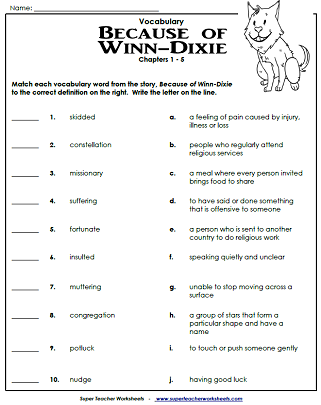 Review the ten vocabulary words from chapters 1 through 5 from the book, Because of Winn-Dixie with these printable cards. This worksheet has eight short answer and multiple choice questions for chapters 6 through 10. This activity has vocabulary words for chapters 6 through 10. Words include trembling, peculiar, irritating, green thumb, and trustworthy. Chapters 6-10 have 5 vocabulary word cards and 5 matching cards with the definition for each of them with this printable file. This picture shows a bird on top of Winn-Dixie's head. Students write a few sentences to describe what's happening in the picture. After reading chapters 11-15, students can answer these eight reading comprehension questions. Students write the missing letters in the puzzle. Word list: ignorant, imitated, whimpering, charming, and routine. 11-15 are: whimpering, imitated, ignorant, routine, and charming. Use the word cards and definition cards together to match and review. This printable worksheet has MC and short answer questions for chapters 16 through 20 of the book. Look up the definition for each underlined word and write it in the space provided. List: sensation, idle, sorrow, and invent. Read and review the vocabulary words and definitions for chapters 16 through 20 with these printable cards. You can laminate them so the cards can be reused. Answer these comprehension questions after reading chapters 21 through 26 of the novel. Match each vocabulary word with its definition. Word list includes: strummed, complicated, appreciated, gentle, myths, swollen, swayed, and frilly. The vocabulary words in chapters 21-26 of the book, Because of Winn-Dixie, include: strummed, appreciate, complicated, arranging, swayed, swollen, gentle, and more. This file has printable word cards and definition cards for all of them. Students write a few sentences to describe the scene in the picture. The illustration shows a girl with a flashlight. These multiple choice, short answer, and matching questions can be used after reading Because of Winn-Dixie. This can be used as a review activity or a quiz. Tell which character is speaking for each quotation from the book. Can you find the hidden words in the puzzle. Words include India Opal, Winn-Dixie, thunderstorm, preacher, lozenge, library, pet store, sorrow, Amanda, Gloria, and Otis. Because of Winn-Dixie graphics on a set of four bookmarks. The question leader writes open-ended questions for the assigned chapters. The summarizer writes a brief overview of what they've read. The illustrator draws a scene from the assigned chapters and shares the picture with the group. The word wizard's job is to find three unique or challenging words from the assigned reading and define them. The RLC's job is to make connections between events in the novel and things that happen in real life. This can be used as a cover page for your literature circle packet. We have literature study units for many different novels, including The Giver, Tales of a Fourth Grade Nothing, Bunnicula, Charlotte's Web, Mr. Popper's Penguins, and many more. This page has a novel study unit for the book, Mr. Popper's Penguins. Includes questions, vocab, and puzzles.